You may have heard your calling is your assignment from God and your identity is Christ. This statement is biblical on the surface but is also potentially misleading. What if someone misinterprets this as the new age idea that you’re an anonymous drop in a bucket? 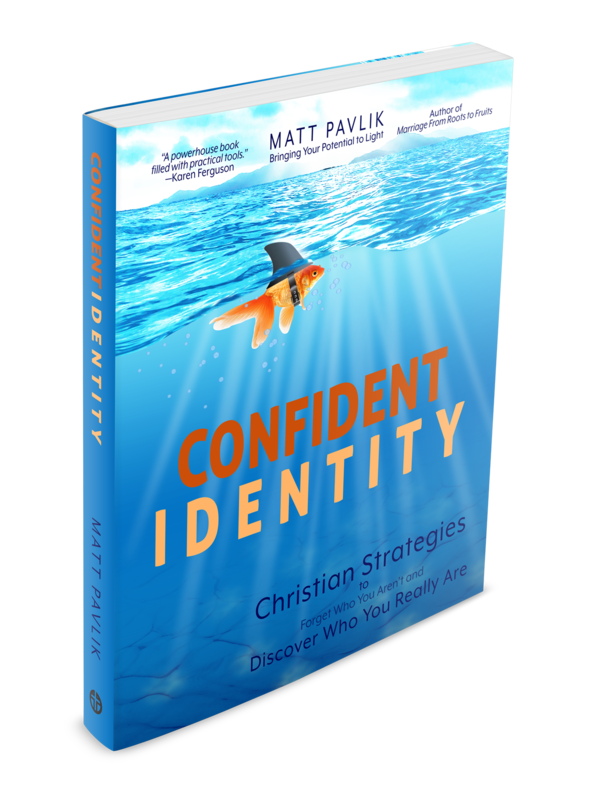 You’re “one with god?” You have no identity, but must live out Christ’s identity? When you become a Christian, do you lose the sense of who you are? No! God designed you so you can’t lose your identity. You’re a one-of-a-kind unique creation. Your identity describes who you are. When you become a Christian, you identify with Christ, but you don’t become Christ. Your identity has a new meaning, but you remain a distinct person. “Who you are.” This definition encapsulates what I mean by identity. “The set of characteristics by which you are definitively recognizable.” This definition clarifies that we can use identity to distinguish you from others. 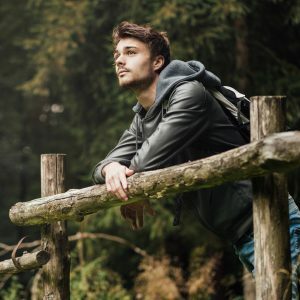 “Your unique characteristics held by no other person.” This definition clarifies that having an identity means you have something that no one else will ever have. “What remains the same, constant, persisting over time, under varying circumstances.” This definition provides the insight that identity must be permanently yours, or else it really isn’t part of you. 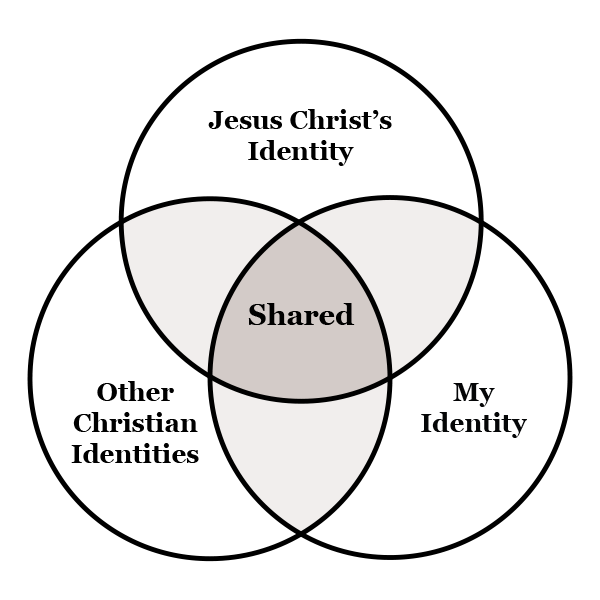 Look at this Venn diagram to see that you have shared attributes, but you also have attributes exclusive to you. Spiritually speaking, a lot is going on inside of you. As Christian, you have the Holy Spirit dwelling within you. You also have the work of Christ applied to your life. If you’re a Christian, you have an agreement with God. You are a new creation because the Holy Spirit takes up residence with you. Although you’re dependent upon God for your spiritual health, you remain a distinct person capable of making your own decisions and manifesting your own personality. Spiritually, you died to sin because of your acceptance of Christ. Whatever Christ did, God considers you to have done it too. Christ sustains your life by faith. “I no longer live” doesn’t mean that you no longer have an identity. This means you yield to Christ because He sustains your spirit. You allow Jesus to do for you want you can’t do for yourself. You’re a distinct being, having your own identity. Your identity is powered by God and the Holy Spirit is working to make your spiritual character pure like Christ. The goal in life isn’t to become a Jesus clone. Instead, God wants you to be a distinct personality that demonstrates the same character as Jesus. Others will appreciate Jesus more when they see a distinct person exhibiting His character than if they see a generic person trying to show love. God is all about co-operation. He wants diversity and unity. God gets all the glory, but He delights in seeing Himself reflected in the many different identities of His people. You experience and exhibit God in ways like no other. Have you found anything at all good about life? If you have an answer to this question, then you have some idea of the meaning of life. I’m so discouraged. Somebody tell me they’ve found something good about life! Sometimes though, we lose sight of the good because of the pain that is screaming in our face. That’s when we have to look deeper. When life hasn’t been easy, we must look beyond this life. Paul is saying that Christ is everything no matter if he’s alive or dead. I’ve got good news and bad news. The good news is that God made a lot of good things about life we can enjoy. The bad news is there will always be something (the curse, our sin, others’ sin) that interferes with our desire for peace and enjoyment. As much as you try to find contentment, there are no guarantees that can make suffering go away permanently (at least not in this life). Finding the meaning of life is like finding gold. I must tell you what might only seem to be obvious: you can’t find gold if your metal-detector is broken. If you’re confused about life, your head is probably too cluttered with discouraging thoughts. Before you can understand life, you need to understand yourself. You can’t find anything good in life if your identity is broken. If you want to know the meaning of life, you first need to calibrate your detector (your identity). God created you, so he is the one to consult when you’re ready to fine-tune your thoughts (or might prefer, ‘get your head screwed on straight’). When you’re thinking clearly, you’ll be able to tell the difference between treasure and junk. Then you can answer the meaning-of-life question for yourself. You have a poor self-image. The negative beliefs you hold about yourself obscure the high values God places on you. You don’t know who you are. You don’t know where to look to find your true value, you look in the wrong places, or you don’t look at all. Self-Esteem is the term used to describe how much you feel good about who you are. You can measure self-esteem on a continuum from negative (horrible) to positive (excellent). Self-Acceptance is how well you embrace who God made you to be, including any of your current imperfections. Self-Confidence is expressing how good you feel about yourself in all that you do. Self-Image is who you think you are. Self-Worth is the value you place on who you are. Negative beliefs come exclusively from negative experiences. When you’ve had many things go wrong, having a high self-esteem is difficult. In order to feel good about yourself, you must develop the skill of sorting through your self-image. What part of what you believe about yourself is really true, and what part is really false? God created you, so only He knows your true value. The more you look in other places, the greater your risk of developing a distorted self-image. Instead you must look to God to see yourself in the same positive way He sees you. When you have the right internal understanding of who you are, your self-esteem will soar, not suffer.